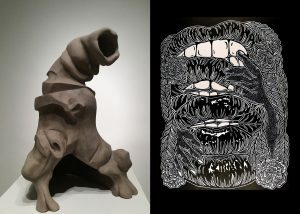 Tuscaloosa – In one of the culminating events of their degree program at UA, Bachelor of Fine Arts candidates Allie Gant and Jennifer Gault present an exhibition, titled Raw & Unfinished Business, in the Sella-Granata Art Gallery, November 5-8, 2018, with a closing reception on Thursday, Nov. 8, from 4 p.m. to 6 p.m. Originally from Fort Lauderdale, Fla., Jennifer Gault’s BFA concentrations are in sculpture and ceramics, with an anthropology minor. She has exhibited her art work in the 2018 Student Sculpture Exhibition, and the 2017 Annual BFA Juried Exhibition, both at Harrison Galleries, and in QuickTurnaround at the Dinah Washington Cultural Arts Center in 2017. In addition, she has published art work in UA’s Marr’s Field Journal in 2018. Gault is the recipient of the Angelo Granata Endowed Scholarship, the Elmore Endowed Scholarship, and the Windgate Charitable Foundation Endowed Studio Arts Scholarship. She works full-time as a certified Fire Alarm Technician in the Office of Environmental Health and Safety at UA. A native of St. Louis, Mo., Allie Gant’s BFA concentrations are in printmaking and ceramics, with an art history minor. In 2017, Gant exhibited her work in Eclectic Way, an exhibition of art from the Paul R. Jones Collection of American Art and art by UA students inspired by those works, at the Paul R. Jones Museum. She participated in Geeza a Wee Exhib, a Scotland study abroad student exhibition in 2018 at Judith Rae Solomon Gallery, in Youngstown State University, Ohio, and has had several pieces accepted for publication in Marr’s Field Journal in 2017 and 2018, including the cover art of both editions. right: Allie Gant, Lips, 2017, 22 x 30 inches, linoleum cut. The Bachelor of Fine Arts degree is the professional degree for the artist; it is also the foundation for the masters program in studio art at UA. For more information about the BFA degree and our other degree programs in the Department of Art and Art History, go to http://art.ua.edu/academics/undergraduate-programs/babfa-in-studio-art/ or contact the department at (205) 348-5967.